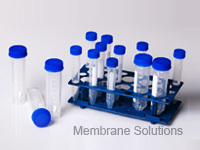 MS® Centrifuge Tubes are made of high-clarity polypropylene with feature black printed graduations and a large white marking spot. 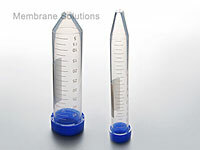 Smooth, flat surface polyethylene caps for conical bottom tubes and plug seal caps for self-standing tubes are included. Special selected high-clarity polypropylene assures the manufacture good transparency, chemical resistibility and obdurability. And the dual quality security system of ISO 9001:2000 quality management and 100,000 grade clean-room cleanness system insures the manufacture good quality. Furthermore, the universal design make the tubes are suitable for most brand of centrifuge. Additionally, either gamma irradiation sterilized or non- sterilized products are available in order to satisfy the different research requirements and enhance the practicability. All the features allow them be widely used in chemical and life science research. Available with two volume of 15 and 50mL. Conical bottom and self-standing bottom. Max.RCF:9,400 for conical bottom tubes; 6,000 for self-standing tubes. Autoclavable at 121℃ and freezable to -80℃.